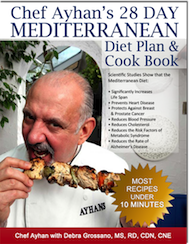 Debra compared Ayhan’s Mediterranean Menu Plans® vs. Atkins Diet™. has less restrictions, and is more convenient. Atkins® is a registered trademark. All product and service marks are the trademarks of their respective owners.